GREETINGS Y’ALL.. I am feeling my southern roots due to the fact that the PNW went from wet/winter/spring to SUMMER in just one day….lol… yep that is just how it happens…no warning just jumps right into summer and while we are only having Mid 80’s temperatures it still seems warm after being in only the 60’s….. You can also tell that we are having summer by the silly grins you will see on us Mossbacks if you look at videos on line. You will also note a high level of bare feet and you do know that the NORTHWEST is the only place where it is considered “COOL” to wear Birkenstocks with socks…winter/spring only. 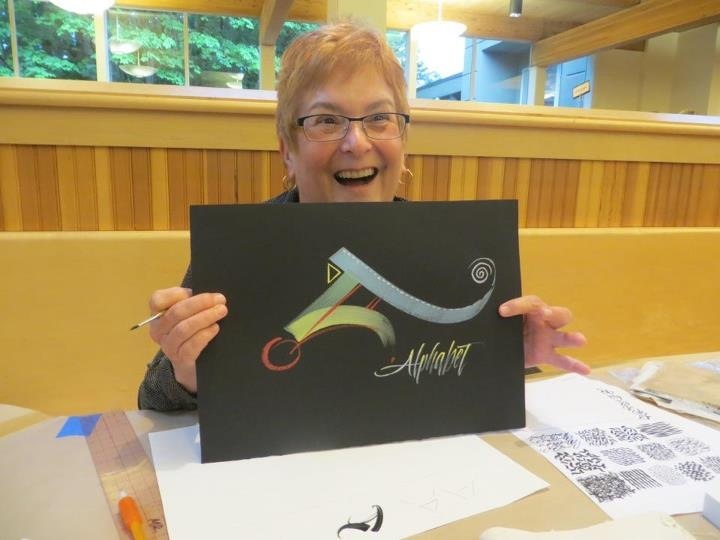 Ok, I have a few more photos to share with you from the calligraphy conference in Portland. They are not my photos but they were gleaned off of FB ( so guess it does have some redeeming value). I am also going to give you a link to the Keynote opening speech by DENIS BROWN. It’s a twenty minute video and he is very funny and its quite well done…and he was in charge of doing it so I assume that he slides easily from the digital world into the calligraphic world. At the end of the video are two other sites, one that he is trying to self publish calligraphic disks for you to learn by and also just to use for inspiration. It’s pretty cheap and I am going to sign up …no word when they will actually be available. Since this is a pre-register I assume he is trying to see if he can get enough to cover his costs before he begins produce them. He does allow those who sign up to see what he has so far. If his keynote speech is any example then they will be great. I don’t know this person but assume it was done by one of the attendee’s to CNW and that it was taken during the sharing time at the end of the conference. Again, I think this might have been done by same person or another person who was taking this class and I am guessing but think the class may have been in Pointed Italic. Again, guessing from a Pointed Italic class . very funny. This is MARILYN REEVES and you can tell by that smile she was having a great time. Well I couldn’t have made more mistakes about the above and they were taken by my friend BONNIE NOEHR and thankfully she read the blog and sent me the correct info so I could set it straight…guess I was in too big a hurry sorry Bonnie. Since the CNW photos were taken by me, perhaps I should clarify. 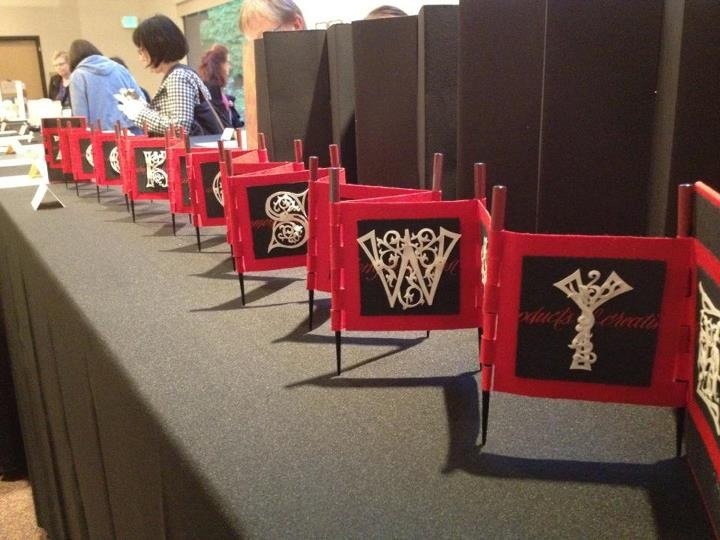 “Hallelujah” was a 7×7″ piece in the participants’ exhibit, not done doing the conference. “Create Joy” was done by Carrie Imai who taught. The “If” piece was mine, done in Martin Jackson’s double stroked letters class. As you can see, all I did was the “I” since I found this challenging. I took the photo of Marilyn during faculty demos night; love what she does with a brush! And, the Weathergrams photo was taken of CNW staff hanging them before the conference began. SORRY everyone, I’ll try to be more patient and get the complete info before I POST…mea culpa. 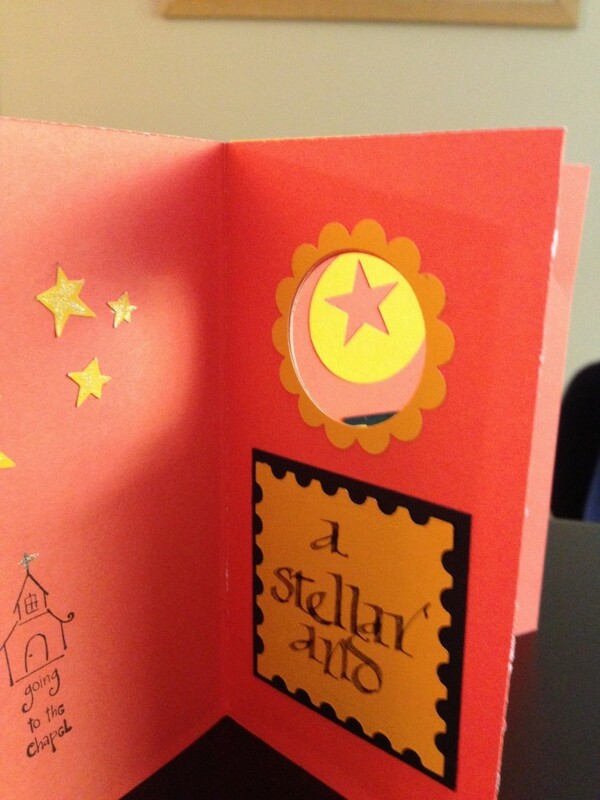 These are another variation on Julie Gray’s cut out letters…very detailed and it was small booklet with a page for each letter. These are students choosing their favorite WEATHERGRAM to take home with them as a souvenir! 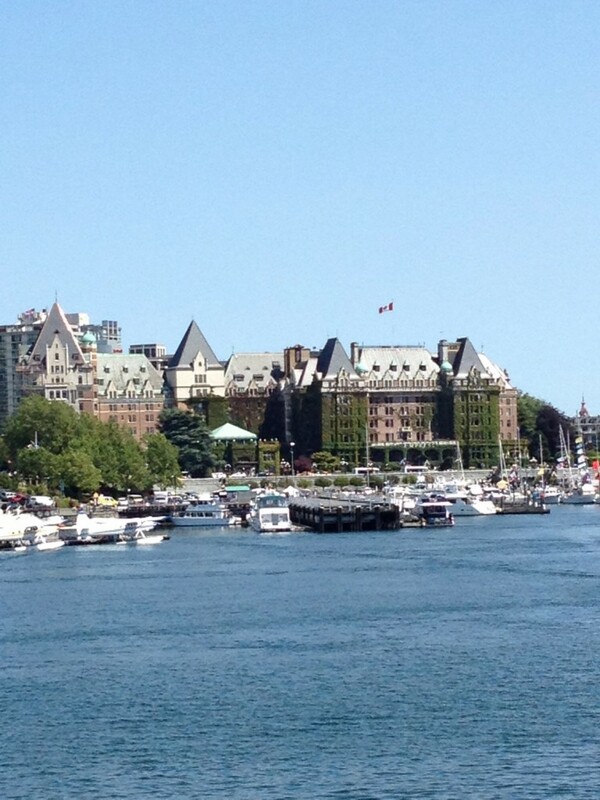 EMPRESS HOTEL and Victoria Harbor taken from back of Ferry as we heading back to Washington. 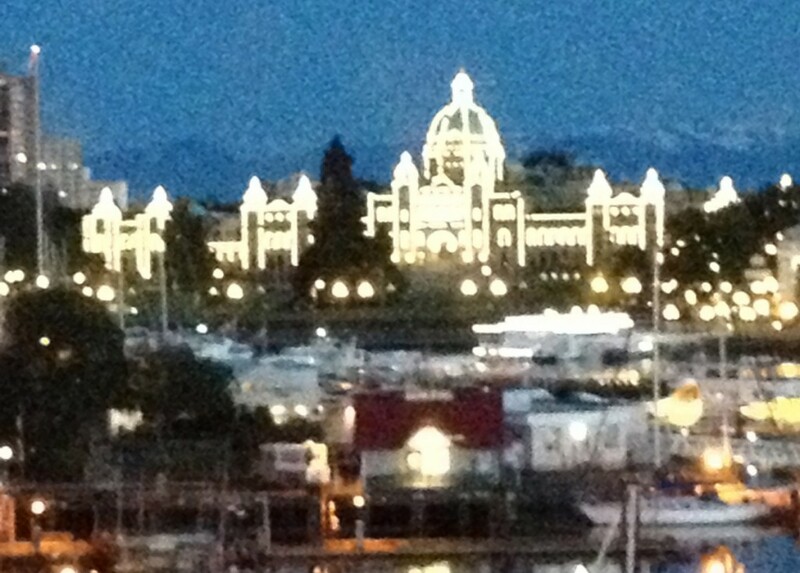 Government Building which is always lighted up at night. 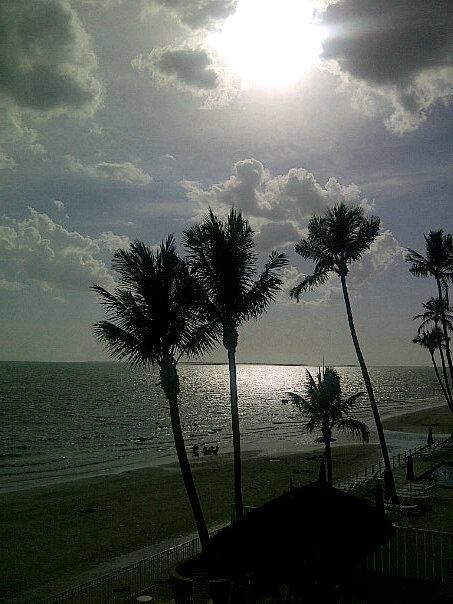 Taken from our hotel room. 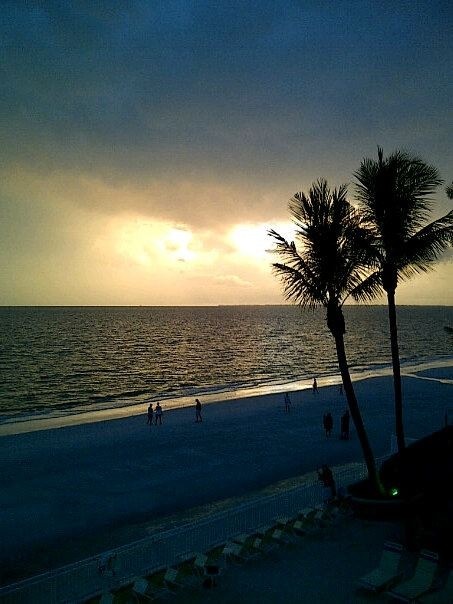 I believe that these photos were taken by my granddaughter Rachel and/or my Daughter Becky from their balcony at the Beach. 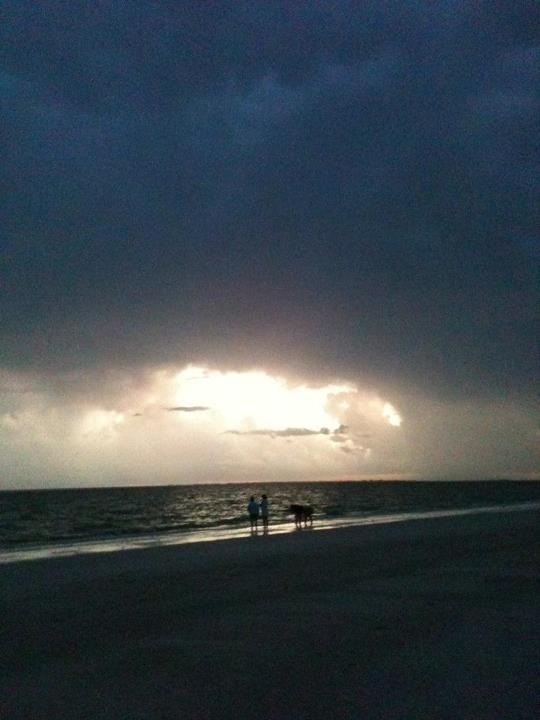 Some of them are storm clouds and she even got one of Lightning and a great one of the moon breaking thru the clouds. 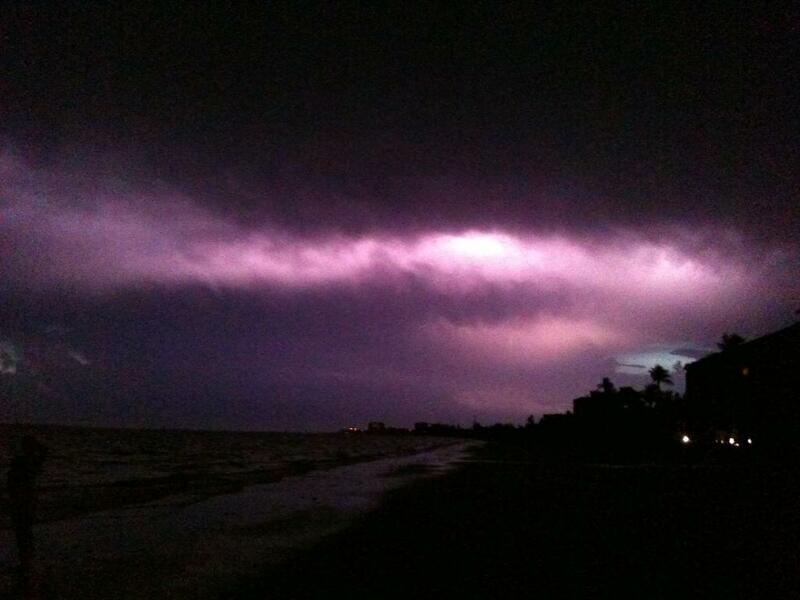 I do miss the storms this time of year as I love thunderstorms , however, I don’t miss the heat that helps to cause them. I think this is kinda a weird name for a card and it basically has a page in the center that has a peep hole… but I can’t come up with a better name for it than she did… Peep Hole in Middle …doesn’t sound to good either…in any case it does what I love it gives the person receiving it a little surprise… and I loved it. Ok this is her sample from the video and I am going to post the one I did. Again… I do recommend that you make up what I call a dummy image and place it with the page where she gives you the dimensions of paper to cut and then you have all of that at your finger tips and it may be all you need to make up a card…but if you need to go see the video again you can always come back to the blog and look at it or when you get it open to her page you can BOOKMARK (APPLE) or list it in your FAVORITES (PC)on your computer and then you have it there also. One thing I would also suggest is that while she is using 81/2 x 11 paper it will require you to use two sheets of paper to make the card… I found that using a piece of 12×12 card stock ( if you have it ) works better and has less waste or scraps left over… don’t know about you but keeping scraps is a pain yet I can’t just throw away reasonably large pieces of paper. 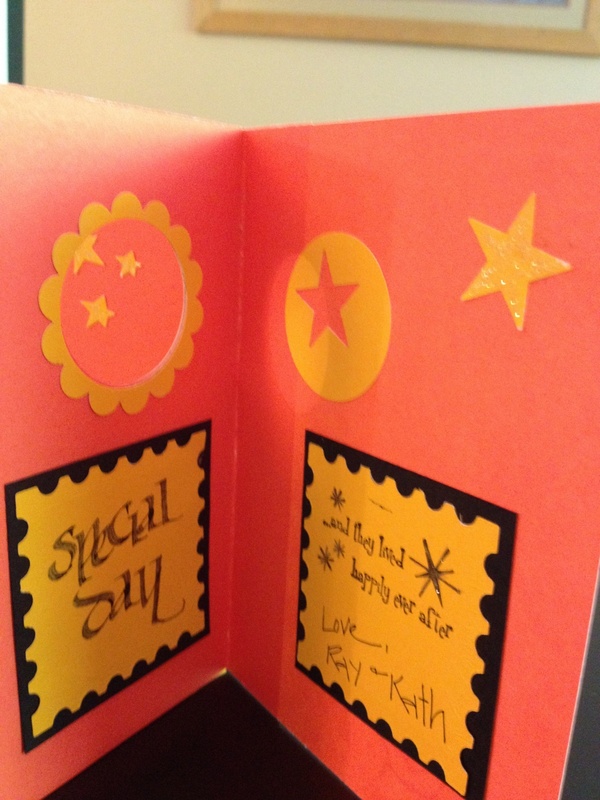 I also liked using a piece that was duplex (double sided …each side different color or pattern) made for a fun card. 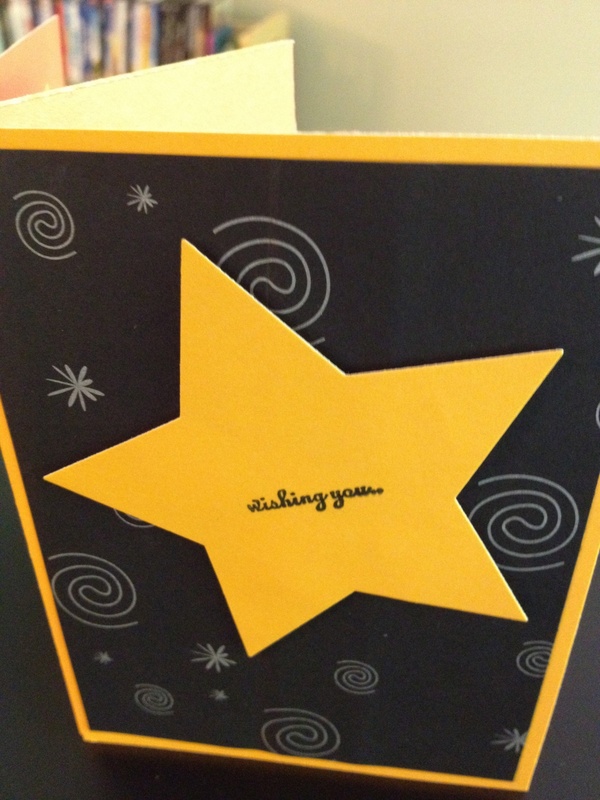 That is what I did with this anniversary card. I have to share a few calligraphy tools with my pen friends…these were found at CNW at PAPER AND INK ARTS…They are called COCOIRO (yeah I can’t say it either) and what they are is first you buy the pen holder basically and then it had multiple colors and even sizes of inserts and the inserts are complete cartridges with very tiny brush tip that can be taken out and put aside with its cap back on ( i.e. DON’T THROW AWAY THE CAP FOR EACH COLOR). This will allow you to write with different colors or you could splurge and buy two penholders and work it that way… in any case…as my mom would say they are the CAT’S PAJAMA’S… first the brush is very tiny and while I know people who can write very tiny with Pentel color brushes or even paint brushes that is not me…so this was wonderful. When you go to link be careful to see that you are buying the FLEXIBLE pen tip not the ball point… I went for the brush tips and you can get different colors of refills for whatever pen body (thats what they call it) you purchase. The sample below is done with the BLUE/BLACK cartridge and that tip is VERY SMALL. Know what else, yeah they are by one of my favorite pen people ZIG…Zig made the first disposable calligraphy pens in 5mm and 2mm that had felt that stayed crisp and sharp ..the Marvey ones always got soft and mush way before they ran out of ink….I even kept the Zig ones after they were out of ink and dipped them in ink instead cause the felt nib was still good. Now I am glad I did as I think they stopped making them with the 5mm tip and switched to only a 3mm which is ok but I love that big one for dramatic letters on an envelope or card. Now speaking of calligraphy (chisel nib) pens there is another new or updated guy on the block… its PIGMA CALLIGRAPHY (which is apparently from SAKURA) my other favorite pen company. These are also available at PAPER AND INK ARTS and that is the link I took you too ( ya’ll do know that there maybe other sources but I am not here to find all the sources but rather to give you a quick fix as to where to get the product and No I don’t get a kickback but merely like to help businesses that work hard to supply me with my needs ok maybe I should say wants…lol ) These come in sets at least that is how I bought them one is a multicolor set of 3mm and the other is multicolor set of 1mm. The great thing about them is that they make really fine hairlines cause their tip is not FELT but rather a hard plastic ( i think) and it stays crisp and sharp also they are great for ” take-along”. They are disposable and not refillable but while I have yet to try it again I bet you can dip them once they are empty. By now you are probably wondering just how many pens do I have…THE ANSWER is unknown and I am thinking seriously of donating my stash to SMITHSONIAN…lol… or at least to one of the calligraphy groups I belong to so that they will go to good homes when I am gone which I hope is long time from now as I have lots of projects and of course this Blog to do… lol. 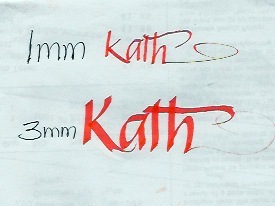 This entry was posted in Calligraphy, Cards, Eye Candy, Tools, Travel by kath. Bookmark the permalink. 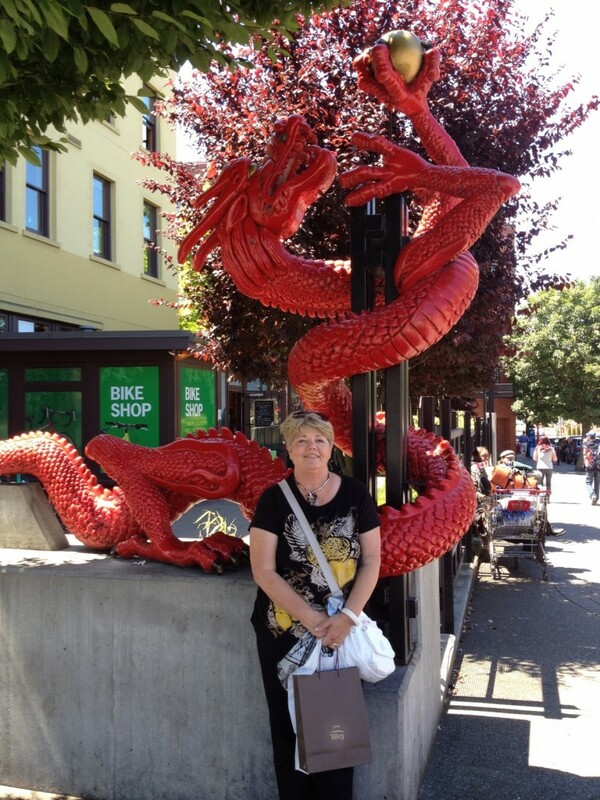 Love the photo of you with the dragon! 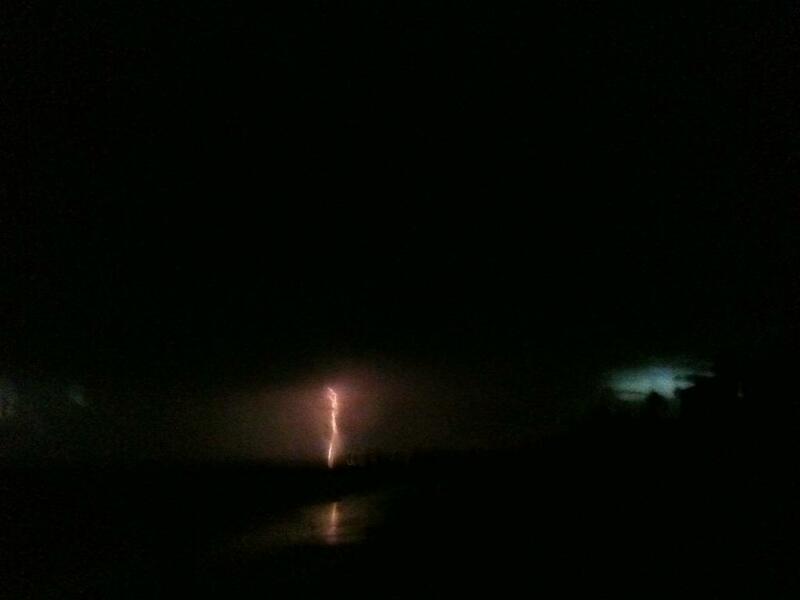 Since the CNW photos were taken by me, perhaps I should clarify. 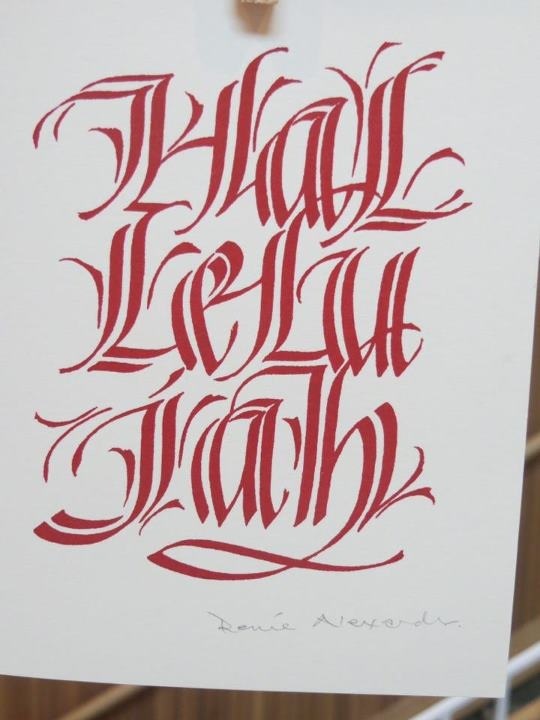 “Hallelujah” was a 7×7″ piece in the participants’ exhibit, not done doing the conference. 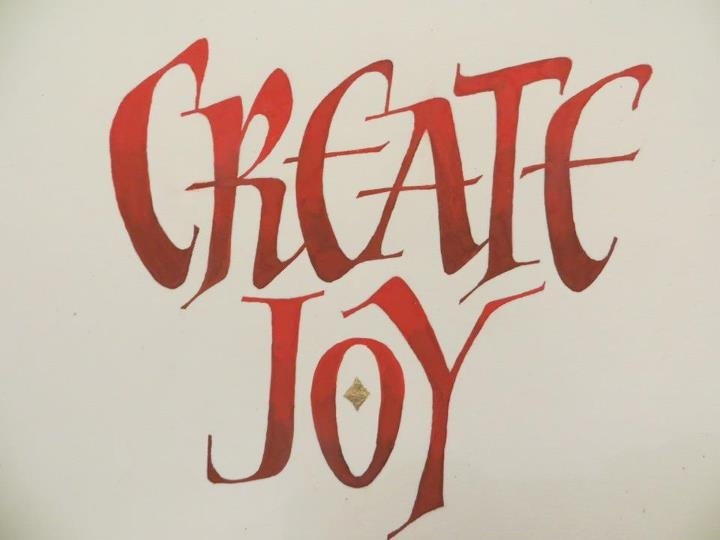 “Create Joy” was done by Carrie Imai who taught. 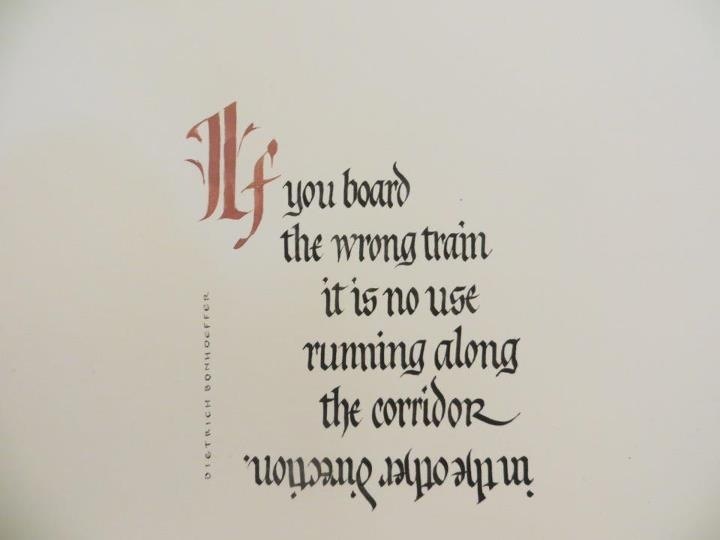 The “If” piece was mine, done in Martin Jackson’s double stroked letters class. As you can see, all I did was the “I” since I found this challenging. I took the photo of Marilyn during faculty demos night; love what she does with a brush! 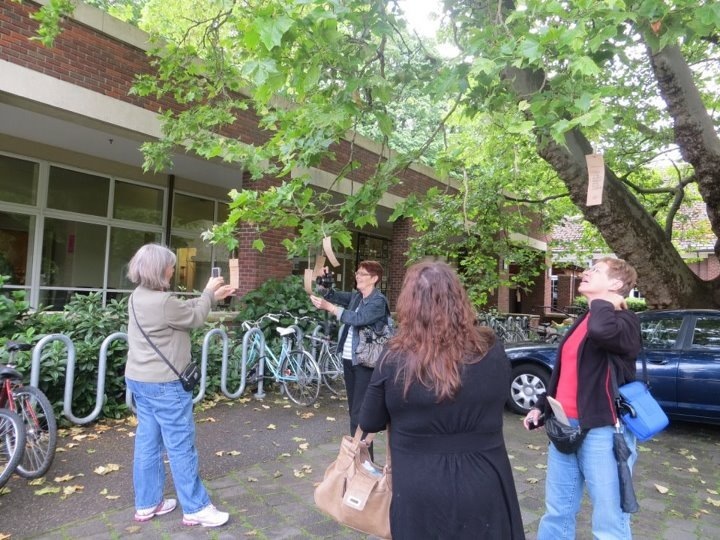 And, the Weathergrams photo was taken of CNW staff hanging them before the conference began.